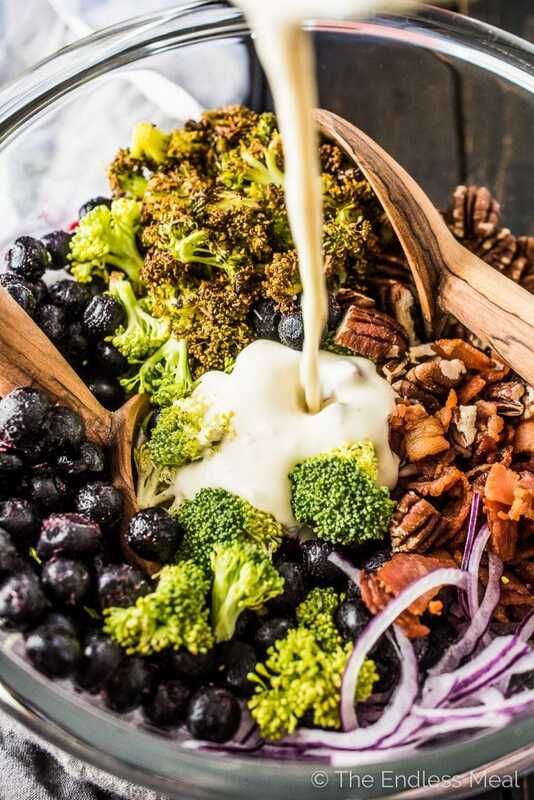 This deliciously Tangy Roasted Broccoli Salad is dotted with fresh or frozen blueberries, bacon, and pecans. It's the perfect healthy winter salad recipe. You will LOVE it! I've been holding out on this recipe for a while. It's not that I don't love you all and want you to have all the good recipes. I do! It's just that I thought this one would be perfect for all things pink day coming up next week. Seriously, how is it almost Valentine's Day already? Seriously though, this salad isn't just the prettiest color ever, it's super delicious, too. If you're looking at these pictures and thinking, “Damn, this salad looks familiar” then you must follow me on Instagram. Or you follow the Whole30 Recipes account. When I was doing a takeover of their Facebook and Instagram accounts back in November, I shared this recipe. There are so many good things going on in this salad that it's hard not to fall in love with it. It's loaded with crispy bacon and toasted pecans, which makes it all things awesome right there. Then there are the blueberries. Don't you just love blueberries? I've used frozen blueberries since it's not blueberry season. I know it sounds a little strange, but it totally works. You can add them frozen straight to the salad and they'll thaw before you serve it. They are a little bit soft, which is perfect in this salad. There's tons of broccoli in here, too. 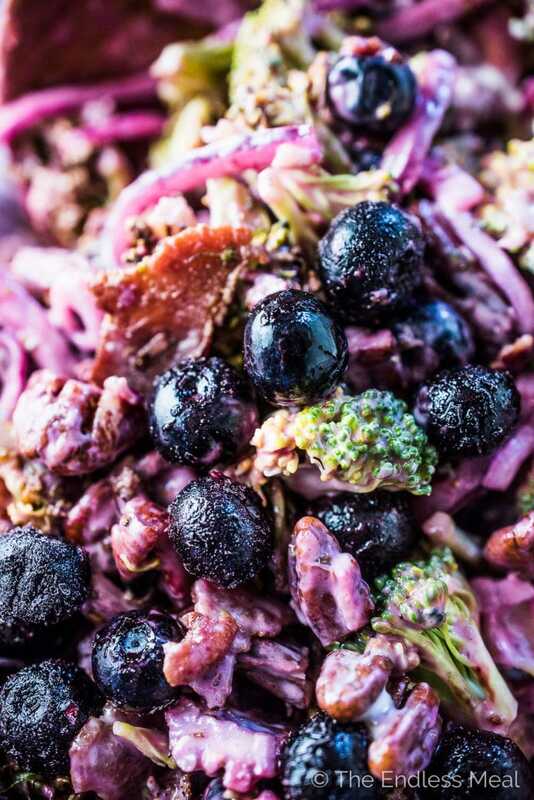 (A roasted broccoli salad with tons of broccoli, go figure. Ha!) But it's true, there is. Three whole heads of it, to be precise. You roast more than half of it until it's crispy and has an almost nutty flavor. It's so delicious. Then there's the dressing that brings it all together. It's a simple creamy vinaigrette that has the perfect amount of tang to it. You're going to love it! 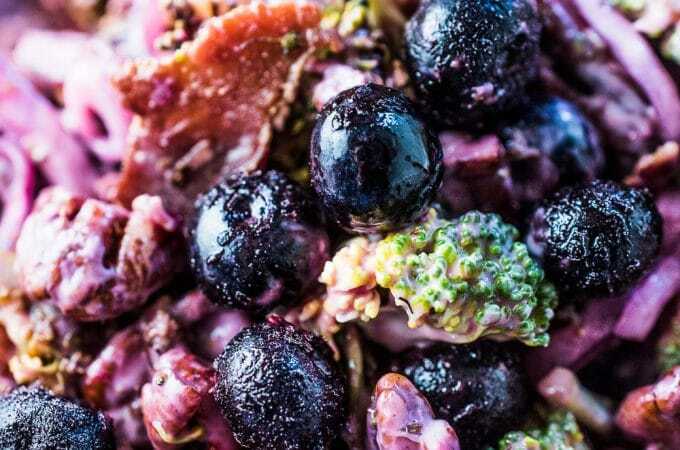 If you love this Tangy Roasted Broccoli Salad with Blueberries, Bacon, and Pecans as much as I do, make sure you give it a 5-star review in the comments below! Cook the bacon in a frying pan until crispy then set aside to cool. Add all the dressing ingredients in a jar and shake well. Add the roasted and raw broccoli to a salad bowl. Add the bacon, pecans, blueberries, and red onion and top with the dressing. Toss well and dig in! To make this a Whole30 compliant and paleo recipe, swap the yogurt with compliant mayonnaise. I never would have thought to put frozen blueberries in here! I’ll try it again once I see fresh ones in season. Really tasty! Fresh ones are so good too!! Amazing! I roasted all of the broccoli because I’m not a fan of raw, otherwise followed the recipe exactly. The dressing alone is wonderful, and then the addition of some of my favorite ingredients that I never would have put together. Thank you for the recipe! I’m so happy you liked the recipe! Hooray!! I am making this dish for a neighborhood gathering tonite. Should I wait to toss all the ingredients together at the last minute or will it hold up in the fridge for a couple of hours? ps. I made the dressing this am -it’s delicious!! When I make , I willlove it! Anything I’ve tried from you, we’ve loved!! Awww thank you so much! That makes me really happy to hear!